For the use as an immunostimulant drug, see Histamine dihydrochloride. Solubility in other solvents Easily soluble in methanol. Very slightly soluble in diethyl ether. Easily soluble in ethanol. Histamine is an organic nitrogenous compound involved in local immune responses, as well as regulating physiological function in the gut and acting as a neurotransmitter for the brain, spinal cord, and uterus. Histamine is involved in the inflammatory response and has a central role as a mediator of itching. As part of an immune response to foreign pathogens, histamine is produced by basophils and by mast cells found in nearby connective tissues. Histamine increases the permeability of the capillaries to white blood cells and some proteins, to allow them to engage pathogens in the infected tissues. It consists of an imidazole ring attached to an ethylamine chain; under physiological conditions, the amino group of the side-chain is protonated. Histamine base, obtained as a mineral oil mull, melts at 83–84 °C. Hydrochloride and phosphorus salts form white hygroscopic crystals and are easily dissolved in water or ethanol, but not in ether. In aqueous solution, the imidazole ring of histamine exists in two tautomeric forms, identified by which of the two nitrogen atoms is protonated. The nitrogen farther away from the side chain is the ‘tele’ nitrogen and is denoted by a lowercase tau sign and the nitrogen closer to the side chain is the ‘pros’ nitrogen and is denoted by the pi sign. The tele tautomer, Nτ-H-histamine, is preferred in solution as compared to the pros tautomer, Nπ-H-histamine. The tele tautomer (Nτ-H-histamine), on the left is more stable than the pros tautomer (Nπ-H-histamine) on the right. Histamine has two basic centres, namely the aliphatic amino group and whichever nitrogen atom of the imidazole ring does not already have a proton. Under physiological conditions, the aliphatic amino group (having a pKa around 9.4) will be protonated, whereas the second nitrogen of the imidazole ring (pKa ≈ 5.8) will not be protonated. Thus, histamine is normally protonated to a singly charged cation. Histamine is a monoamine neurotransmitter. Histamine is derived from the decarboxylation of the amino acid histidine, a reaction catalyzed by the enzyme L-histidine decarboxylase. It is a hydrophilic vasoactive amine. Once formed, histamine is either stored or rapidly inactivated by its primary degradative enzymes, histamine-N-methyltransferase or diamine oxidase. In the central nervous system, histamine released into the synapses is primarily broken down by histamine-N-methyltransferase, while in other tissues both enzymes may play a role. Several other enzymes, including MAO-B and ALDH2, further process the immediate metabolites of histamine for excretion or recycling. Bacteria also are capable of producing histamine using histidine decarboxylase enzymes unrelated to those found in animals. A non-infectious form of foodborne disease, scombroid poisoning, is due to histamine production by bacteria in spoiled food, particularly fish. Fermented foods and beverages naturally contain small quantities of histamine due to a similar conversion performed by fermenting bacteria or yeasts. Sake contains histamine in the 20–40 mg/L range; wines contain it in the 2–10 mg/L range. Most histamine in the body is generated in granules in mast cells and in white blood cells (leukocytes) called basophils. Mast cells are especially numerous at sites of potential injury — the nose, mouth, and feet, internal body surfaces, and blood vessels. Non-mast cell histamine is found in several tissues, including the brain, where it functions as a neurotransmitter. Another important site of histamine storage and release is the enterochromaffin-like (ECL) cell of the stomach. The most important pathophysiologic mechanism of mast cell and basophil histamine release is immunologic. These cells, if sensitized by IgE antibodies attached to their membranes, degranulate when exposed to the appropriate antigen. Certain amines and alkaloids, including such drugs as morphine, and curare alkaloids, can displace histamine in granules and cause its release. Antibiotics like polymyxin are also found to stimulate histamine release. Histamine release occurs when allergens bind to mast-cell-bound IgE antibodies. Reduction of IgE overproduction may lower the likelihood of allergens finding sufficient free IgE to trigger a mast-cell-release of histamine. In humans, histamine exerts its effects primarily by binding to G protein-coupled histamine receptors, designated H1 through H4. As of 2015, histamine is believed to activate ligand-gated chloride channels in the brain and intestinal epithelium. • CNS: Expressed on the dendrites of the output neurons of the histaminergic tuberomammillary nucleus, which projects to the dorsal raphe, locus coeruleus, and additional structures. • Periphery: Causes bronchoconstriction, bronchial smooth muscle contraction, vasodilation, promotes hypernociception (visceral hypersensitivity), involved in itch perception and urticaria. • Periphery: Primarily involved in vasodilation and stimulation of gastric acid secretion. Modulates gastrointestinal function. Although histamine is small compared to other biological molecules (containing only 17 atoms), it plays an important role in the body. It is known to be involved in 23 different physiological functions. Histamine is known to be involved in many physiological functions because of its chemical properties that allow it to be versatile in binding. It is Coulombic (able to carry a charge), conformational, and flexible. This allows it to interact and bind more easily. When injected intravenously, histamine causes most blood vessels to dilate, and hence causes a fall in the blood pressure. This is a key mechanism in anaphylaxis, and is thought to be caused when histamine releases nitric oxide, endothelium-derived hyperpolarizing factors and other compounds from the endothelial cells. Histamine is a neurotransmitter that is released from histaminergic neurons which project out of the mammalian hypothalamus. The cell bodies of these neurons are located in a portion of the posterior hypothalamus known as the tuberomammillary nucleus (TMN). The histamine neurons in this region comprise the brain’s histamine system, which projects widely throughout the brain and includes axonal projections to the cortex, medial forebrain bundle, and elsewhere. The histamine neurons in the TMN are involved in regulating the sleep-wake cycle and promote arousal when activated. The neural firing rate of histamine neurons in the TMN is strongly positively correlated with an individual’s state of arousal. These neurons fire rapidly during periods of wakefulness, fire more slowly during periods of relaxation/tiredness, and stop firing altogether during REM and NREM (non-REM) sleep. First-generation H1 antihistamines (i.e., antagonists of histamine receptor H1) are capable of crossing the blood–brain barrier and produce drowsiness by antagonizing histamine H1 receptors in the tuberomammillary nucleus. The newer class of second-generation H1 antihistamines do not readily permeate the blood–brain barrier and thus are less likely to cause sedation, although individual reactions, concomitant medications and dosage may increase the likelihood of a sedating effect. In contrast, histamine H3 receptor antagonists increase wakefulness. Similar to the sedative effect of first-generation H1 antihistamines, an inability to maintain vigilance can occur from the inhibition of histamine biosynthesis or the loss (i.e., degeneration or destruction) of histamine-releasing neurons in the TMN. Enterochromaffin-like cells, located within the gastric glands of the stomach, release histamine that stimulates nearby parietal cells by binding to the apical H2 receptor. Stimulation of the parietal cell induces the uptake of carbon dioxide and water from the blood, which is then converted to carbonic acid by the enzyme carbonic anhydrase. Inside the cytoplasm of the parietal cell, the carbonic acid readily dissociates into hydrogen and bicarbonate ions. The bicarbonate ions diffuse back through the basilar membrane and into the bloodstream, while the hydrogen ions are pumped into the lumen of the stomach via a K+/H+ ATPase pump. Histamine release is halted when the pH of the stomach starts to decrease. Antagonist molecules, like ranitidine, block the H2 receptor and prevent histamine from binding, causing decreased hydrogen ion secretion. While histamine has stimulatory effects upon neurons, it also has suppressive ones that protect against the susceptibility to convulsion, drug sensitization, denervation supersensitivity, ischemic lesions and stress. It has also been suggested that histamine controls the mechanisms by which memories and learning are forgotten. Libido loss and erectile failure can occur during treatment with histamine H2 receptor antagonists such as cimetidine, ranitidine, and risperidone. The injection of histamine into the corpus cavernosum in men with psychogenic impotence produces full or partial erections in 74% of them. It has been suggested that H2 antagonists may cause sexual difficulties by reducing the uptake[clarification needed] of testosterone. Metabolites of histamine are increased in the cerebrospinal fluid of people with schizophrenia, while the efficiency of H1 receptor binding sites is decreased. Many atypical antipsychotic medications have the effect of increasing histamine production, because histamine levels seem to be imbalanced in people with that disorder. Histamine therapy for treatment of multiple sclerosis is currently being studied. The different H receptors have been known to have different effects on the treatment of this disease. The H1 and H4 receptors, in one study, have been shown to be counterproductive in the treatment of MS. The H1 and H4 receptors are thought to increase permeability in the blood-brain barrier, thus increasing infiltration of unwanted cells in the central nervous system. This can cause inflammation, and MS symptom worsening. The H2 and H3 receptors are thought to be helpful when treating MS patients. Histamine has been shown to help with T-cell differentiation. This is important because in MS, the body’s immune system attacks its own myelin sheaths on nerve cells (which causes loss of signaling function and eventual nerve degeneration). By helping T cells to differentiate, the T cells will be less likely to attack the body’s own cells, and instead attack invaders. As an integral part of the immune system, histamine may be involved in immune system disorders and allergies. 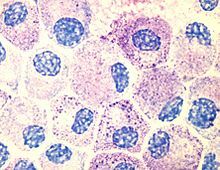 Mastocytosis is a rare disease in which there is a proliferation of mast cells that produce excess histamine. 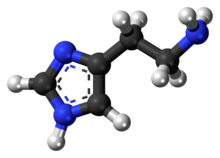 The properties of histamine, then called β-iminazolylethylamine, were first described in 1910 by the British scientists Henry H. Dale and P.P. Laidlaw. By 1913 the name histamine was in use, using combining forms of histo- + amine, yielding “tissue amine”. “H substance” or “substance H” are occasionally used in medical literature for histamine or a hypothetical histamine-like diffusible substance released in allergic reactions of skin and in the responses of tissue to inflammation. ^ a b Histamine Material Safety Data Sheet (Technical report). sciencelab.com. 2013-05-21. Archived from the original on 2012-03-24. ^ a b Vuckovic, Dajana; Pawliszyn, Janusz (15 March 2011). “Systematic Evaluation of Solid-Phase Microextraction Coatings for Untargeted Metabolomic Profiling of Biological Fluids by Liquid Chromatography−Mass Spectrometry”. Analytical Chemistry. Supporting Information. 83 (6): 1944–1954. doi:10.1021/ac102614v. PMID 21332182. ^ Marieb, E. (2001). Human anatomy & physiology. San Francisco: Benjamin Cummings. p. 414. ISBN 0-8053-4989-8. ^ Nieto-Alamilla, G; Márquez-Gómez, R; García-Gálvez, AM; Morales-Figueroa, GE; Arias-Montaño, JA (November 2016). “The Histamine H3 Receptor: Structure, Pharmacology, and Function”. Molecular Pharmacology. 90 (5): 649–673. doi:10.1124/mol.116.104752. PMID 27563055. ^ Andersen HH, Elberling J, Arendt-Nielsen L (2015). “Human surrogate models of histaminergic and non-histaminergic itch” (PDF). Acta Dermato-Venereologica. 95: 771–7. doi:10.2340/00015555-2146. PMID 26015312. ^ Di Giuseppe, M.; et al. (2003). Nelson Biology 12. Toronto: Thomson Canada. p. 473. ISBN 0-17-625987-2. ^ “Histamine”. webbook.nist.gov. Archived from the original on 2018-04-27. ^ “Histamine dihydrochloride H7250”. Sigma-Aldrich. Archived from the original on 2015-08-09. ^ Paiva, T. B.; Tominaga, M.; Paiva, A. C. M. (1970). “Ionization of histamine, N-acetylhistamine, and their iodinated derivatives”. Journal of Medicinal Chemistry. 13 (4): 689–692. doi:10.1021/jm00298a025. PMID 5452432. ^ a b c d e f g Panula P, Chazot PL, Cowart M, et al. (2015). “International Union of Basic and Clinical Pharmacology. XCVIII. Histamine Receptors”. Pharmacol. Rev. 67 (3): 601–55. doi:10.1124/pr.114.010249. PMC 4485016. PMID 26084539. ^ a b c d Wouters MM, Vicario M, Santos J (2015). “The role of mast cells in functional GI disorders”. Gut. 65: 155–168. doi:10.1136/gutjnl-2015-309151. PMID 26194403. ^ Blandina, Patrizio; Munari, Leonardo; Provensi, Gustavo; Passani, Maria B. (2012). “Histamine neurons in the tuberomamillary nucleus: a whole center or distinct subpopulations?”. Frontiers in Systems Neuroscience. 6. doi:10.3389/fnsys.2012.00033. ^ Maguire JJ, Davenport AP (29 November 2016). “H2 receptor”. IUPHAR/BPS Guide to PHARMACOLOGY. International Union of Basic and Clinical Pharmacology. Archived from the original on 21 March 2017. Retrieved 20 March 2017. ^ Noszal, B.; Kraszni, M.; Racz, A. (2004). “Histamine: fundamentals of biological chemistry”. In Falus, A.; Grosman, N.; Darvas, Z. Histamine: Biology and Medical Aspects. Budapest: SpringMed. pp. 15–28. ISBN 380557715X. ^ Dale, HH; Laidlaw, PP (31 December 1910). “The physiological action of beta-iminazolylethylamine”. The Journal of Physiology. 41 (5): 318–44. doi:10.1113/jphysiol.1910.sp001406. PMC 1512903. PMID 16993030. Monroe EW, Daly AF, Shalhoub RF (February 1997). “Appraisal of the validity of histamine-induced wheal andï flare to predict the clinical efficacy of antihistamines”. J. Allergy Clin. Immunol. 99 (2): S798–806. doi:10.1016/s0091-6749(97)70128-3. PMID 9042073. ^ Brown, RE; Stevens, DR; Haas, HL (2001). “The Physiology of Brain Histamine”. Progress in Neurobiology. 63 (6): 637–672. doi:10.1016/s0301-0082(00)00039-3. PMID 11164999. ^ Yanai, K; Tashiro, M (2007). “The physiological and pathophysiological roles of neuronal histamine: an insight from human positron emission tomography studies”. Pharmacology & Therapeutics. 113 (1): 1–15. doi:10.1016/j.pharmthera.2006.06.008. PMID 16890992. ^ Alvarez, EO (2009). “The role of histamine on cognition”. Behavioural Brain Research. 199 (2): 183–9. doi:10.1016/j.bbr.2008.12.010. PMID 19126417. ^ a b White, JM; Rumbold, GR (1988). “Behavioural effects of histamine and its antagonists: a review”. Psychopharmacology. 95 (1): 1–14. doi:10.1007/bf00212757. PMID 3133686. ^ Cará, AM; Lopes-Martins, RA; Antunes, E; Nahoum, CR; De Nucci, G (1995). “The role of histamine in human penile erection”. British Journal of Urology. 75 (2): 220–4. doi:10.1111/j.1464-410X.1995.tb07315.x. PMID 7850330. ^ Ito, C (2004). “The role of the central histaminergic system on schizophrenia”. Drug News & Perspectives. 17 (6): 383–7. doi:10.1358/dnp.2004.17.6.829029. PMID 15334189. Many atypical antipsychotics also increased histamine turnovers. ^ Jadidi-Niaragh F, Mirshafiey A (September 2010). “Histamine and histamine receptors in pathogenesis and treatment of multiple sclerosis”. Neuropharmacology. 59 (3): 180–9. doi:10.1016/j.neuropharm.2010.05.005. PMID 20493888. Archived from the original on 2018-04-27. ^ E. Zampeli; E. Tiligada. “The role of histamine H4 receptor in immune and inflammatory disorders”. Department of Pharmacology, Medical School, National and Kapodistrian University of Athens, Athens, Greece. 157: 24–33. doi:10.1111/j.1476-5381.2009.00151.x. PMC 2697784. PMID 19309354. ^ Valent P, Horny HP, Escribano L, et al. (July 2001). “Diagnostic criteria and classification of mastocytosis: a consensus proposal”. Leuk. Res. 25 (7): 603–25. doi:10.1016/S0145-2126(01)00038-8. PMID 11377686. Archived from the original on 2018-04-27. ^ Dale HH, Laidlaw PP (December 1910). “The physiological action of β-iminazolylethylamine” (PDF). J. Physiol. 41 (5): 318–44. doi:10.1113/jphysiol.1910.sp001406. PMC 1512903. PMID 16993030.